The Louisiana black bear population is approximated at about 500 bears, one-fourth of the number of pandas in China. South of Baton Rouge, on a gravel road through a swamp, one of the 500 black bears in all of Louisiana is lying on her side. She’s unconscious. Her small eyes are closed and her breathing is shallow. Her tongue hangs from her mouth. Her rounded ears, which look too big for her head, are twitching. A biologist with the Louisiana Department of Wildlife and Fisheries sedated her by firing a dart into her shoulder. Now he’s fitting a GPS-enabled collar around her neck, adjusting it to the right size. Tracking this animal will help him learn about and keep protecting a threatened and storied species. Once innumerable in the Lower Mississippi River Valley, then almost wiped out, Louisiana black bears are slowly clawing back from the brink of extinction. There are no easy opportunities to get this close to a Louisiana black bear. Only 500 of the bears are estimated to exist — one-fourth of the number of pandas in China — and private landowners hold much of the terrain where they roam. The state biologist and I are here this evening with the permission of the company that owns the expansive swamp. In addition to the bears’ rarity and seclusion, they’re skittish; confronted by a human, a black bear is inclined to run off or climb a tree, not stand its ground. Perhaps the closest encounter a person can hope for is a glimpse of one disappearing into the woods alongside a country road. And indeed, this marks the first time that I, a New Orleanian, have laid eyes on the official state mammal. We’re ten miles from the Gulf of Mexico, at the foot of the Atchafalaya River Basin. A quarter of Louisiana’s black bears live along the Gulf Coast in a soggy, 50-mile stretch between Avery Island in the west, where Tabasco hot sauce is made, and Morgan City in the east. The other bears in the state are 100-plus miles north of here, separated from the coastal population by busy highways, including Interstate 10. Tonight, the mosquitoes are relentless. 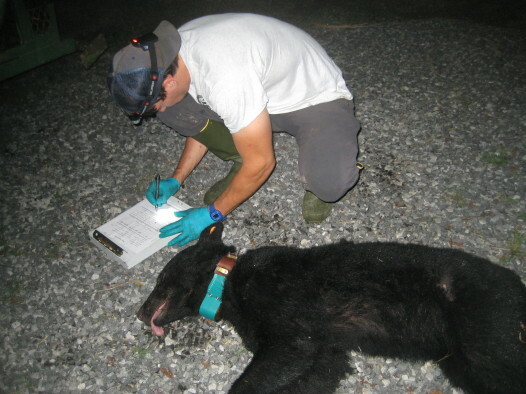 After spraying himself with repellent, the state biologist, Sean Murphy, works on the young bear under the glow of a headlamp. Besides the GPS collar, he implants an identifying microchip between her shoulder blades, plastic tags in her earlobes, and a tattoo of green ink inside her upper lip. He removes a tuft of fur for a DNA sample, a vial’s worth of blood to test for parasites, and a recessed tooth that will determine her age. (Bear teeth, like tree trunks, develop rings through the years.) Murphy guesses this bear is approaching her third birthday, the age she can begin to have cubs. She weighs only about 100 pounds. “She’s a little girl,” Murphy said when he opened the culvert pipe trap and dragged her limp body from it, his dart still in her shoulder. He should know, having handled other bears in the mountains of Kentucky and the sand hills of central Florida. Only a day earlier, he had situated the trap near a crawfish pond and baited it with, of all possible foods, six glazed donuts. (Yes, there’s a Krispy Kreme, in Baton Rouge, whose stale donuts end up in the bellies of black bears.) This particular animal needed the meal. Her petite stature undermines William Faulkner’s description, in his hunting story “The Bear,” of a black bear’s “ thick, locomotive-like shape.” Old Ben she is not, that’s for sure. The Louisiana black bear is the smallest and scarcest of 16 subspecies of American black bear. The entire animal considered, the physical distinctions of the Louisiana subspecies are slight. It has a longer, narrower skull than other black bears, and larger molar teeth — perfect for chomping on sugarcane and acorns. Yet these physical distinctions, combined with geography, are enough to be a lifesaver: Louisiana black bears within their historical range, including all of Louisiana, eastern Texas, and the southern two-thirds of Mississippi, have been protected since 1992 under the Endangered Species Act. By the early 1900s they had been hunted to near-extinction, for their pelts, their meat (which, by many accounts, tastes like a gamy, dense variety of beef), and for the oil rendered from their fat. Agriculture and other forms of development cleared 80 percent of the bears’ natural habitat, the jungly hardwood forests of the Mississippi River floodplain. The animals vanished entirely from Texas by 1940. A handful, if any, survived in Mississippi. See a bear, take a bear, was the collective mindset for too long, and humans, with our guns, chainsaws, and vehicles, remain the biggest threat to their survival. But in the Bayou State, the black bear population in counted areas has grown by a promising two-thirds since receiving federal protection, from 300 to 500. The animals have fared even better along the eroding coastline, despite having to compete with people for dry land; since 1999, the coastal bear population is up 75 percent — from 80 bears to 140. Although we were awfully slow to rally around Louisiana black bears, we weren’t too slow. Maria Davidson, who manages the State of Louisiana’s bear effort, thinks the animals are back for good. “I personally believe we have recovered the bear,” she said at the end of last year while noting that data collected by Sean Murphy and other researchers are still being interpreted. If Davidson is right, you can add the black bear to the list of species in Louisiana saved by human interest. The American alligator will have company. Make some room, brown pelican. For now, with only hundreds of Louisiana black bears alive, every one can seem especially precious, including this little girl. An hour after she was sedated, her anesthesia is wearing off. The biologist finishes his work-up and doffs his latex gloves. The bear first lifts her head from the road. She looks at us curiously. With no small amount of effort, she rolls onto her belly and sits up on her haunches. She climbs to all fours. She tries a couple of steps forward, then tumbles to the gravel and onto her back, her feet flying up in the air. This clumsiness is endearing. Finally the bear recognizes something of her surroundings. Galloping for the edge of the woods, arriving at a patch of reeds, she somersaults into them. We can hear her moving away even after we lose sight of her. Then it’s just frogs and cicadas. It’s true that the state didn’t try to regulate Coursera per se–it just told Coursera that all of its university partners were in Write My Essay violation of state law by using Coursera. To comply with state law, each of those universities was going to have to go through the Minnesota Office of Higher Education’s application and registration process, pay fees, etc. Minnesota wanted Coursera to work with all of its partners to do that, and Coursera declined, pointing out that it wouldn’t be able to offer free courses if all its partner institutions had to pay all 50 states and who-knows-how-many countries in order to participate. So it changed its terms of service instead. I have seen another post like this on a Quality Link Building Services company where people were offering that most of use we read for this issue to submit in the court of local justice in front of Mr. Robert, a local judge.